I miss the old Fox and Obel at 401 East Illinois Street in Streeterville. With four kids we make the occasional detour to Navy Pier and enjoyed the café there. It offered great food choices for the whole family in a nice setting. 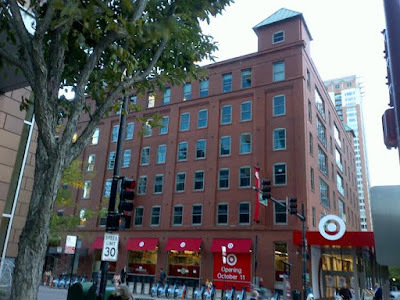 In with the new Target store set to open October 11th. Here's hoping they will step up the café food game in this attractive urban location along with serving wine and beer for mom and dad. Condo units at nearby 160 East Illinois and 240 East Illinois buildings sell at a median price over $500,000.